Sir2 (shades of blue) bound to NAD (red) and a domain from Sir4 (green). Our cells build seven different sirtuins (termed SIRT1-SIRT7). They perform a variety of functions. Some perform the canonical function of modifying histones and regulating transcription. Others target proteins in the cytoplasm and mitochondria, and are implicated in regulating a wide array of processes such as metabolism and neurodegeneration. Some specialize in removing acetyl groups, while others remove larger modifications such as attached lipids, or create new modifications. Continued study of these molecules has revealed additional strong connections to aging in many organisms. Sirtuins perform an unusual reaction using a familiar cofactor. They take NAD, a cofactor that is normally involved in electron transport, and remove its signature nicotinamide ring. Then, they extract the acetyl group from their target protein and attach it to the remaining fragment of NAD. Structures of sirtuins, such as the structure of Sir2 in PDB entry 4iao, have a distinctive structure. They have two domains that grip NAD and position the acetylated lysine next to it, catalyzing the transfer reaction. Some sirtuins also have additional domains that interact with other regulatory proteins, such as Sir4 included in this structure. 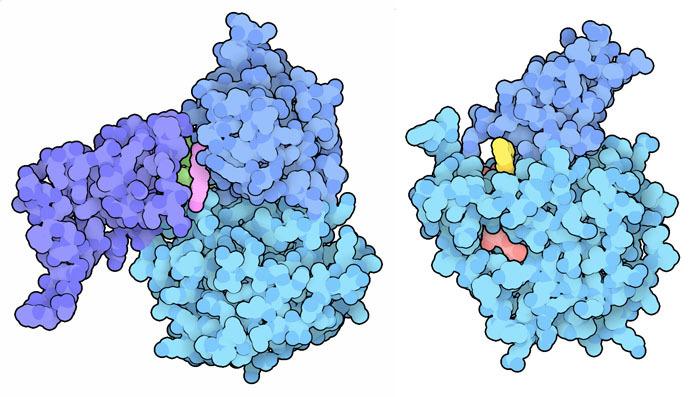 SIRT1 (left) bound to resveratrol (magenta), and SIRT6 (right) bound to an NAD analog (red) and an allosteric activator (yellow). Discovery of the connections between sirtuins and aging launched an extensive search for compounds that can enhance the action of sirtuins. Resveratrol, a natural compound found in grape skins and other fruit, was one of the first candidates, and was widely (and probably over-enthusiastically) promoted in the popular media. The structure of resveratrol with SIRT1 (PDB entry 5btr) shows that it may act allosterically, helping to close down the domains of the protein and promote its action. Thousands of other compounds have since been tested. For instance, the compound in PDB entry 5mf6 is a selective activator of SIRT6, and shows a similar allosteric mechanism. Two structures show a bacterial sirtuin before and after its reaction. On the left (PDB entry 2h4f), NAD is bound in the active site along with a small peptide from P53 tumor suppressor. 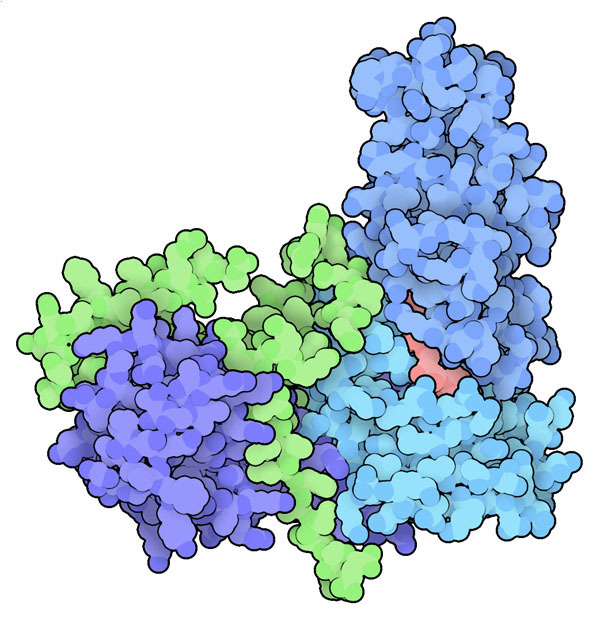 An acetylated lysine in the peptide is gripped by the enzyme and positioned close to the NAD. After the reaction (PDB entry 2h59). the acetyl group has been transferred to NAD, releasing the nicotinamide ring (shown in magenta in the first structure) in the process. Click on the image to explore these structures in more detail. Many structures for human sirtuins have been determined: find them by searching for “sirtuin”, then limit the search to “Homo sapiens” using the options in the left-hand menu. Sirtuins are flexible, opening and closing during their reactions. Use the structure comparison tool to explore this flexibility, for instance, in two forms of SIRT2 (1j8f and 3zgv). 5mf6: You W, Rotili D, Li TM, Kambach C, Meleshin M, Schutkowshi M, Chua KF, Mai A & Steegborn C (2017) Structural basis of Sirtuin 6 activation by synthetic small molecules. Angewandte Chemie 56, 1007-1011. Bonkowski MS & Sinclair DA (2016) Slowing ageing by design: the rise of NAD+ and sirtuin-activating compounds. Nature Reviews Molecular Cell Biology 17, 679-690. Sacconnay L, Carrupt PA & Nurisso A (2016) Human sirtuins: structures and flexibility. Journal of Structural Biology 196, 534-542. 5btr: Cao D, Wang M, Qiu X, Liu D, Jiang H, Yang N & Xu RM (2015) Structural basis for allosteric, substrate-dependent stimulation of SIRT1 activity by resveratrol. Genes Development 29, 1316-1325. 4iao: Hsu HC, Wang CL, Wang M, Yang N, Chen Z, Sternglanz R, Xu RM (2013) Structural basis for allosteric stimulation of Sir2 activity by Sir4 binding. Genes Development 27, 64-73. 2h4f, 2h59: Hoff KG, Avalos JL, Sens K & Wolberger C (2006) Insights in the sirtuin mechanism from ternary complexes containing NAD(+) and acetylated peptide. Structure 14, 1231-1240.